Birth of Jacob and Esau. The 'Aḳedah in Jewish Liturgy. Second patriarch; son of Abraham and Sarah. He was the child of a miracle, for at the time of his birth his mother, hitherto childless, was ninety years old, and his father a hundred. By the command of God the child was named "Isaac" ( ; in poetical language = "laughter"), because Abraham had, covertly, laughed in incredulity when, a year previously, he had received the promise of God that a son would be born to him by Sarah (Gen. xvii. 17); so also did Sarah as, standing at the door of the tent, she heard the promise reiterated by the angel (Gen. xviii. 12). Isaac was circumcised when he was eight days old, and at his weaning the parents manifested their joy by giving a great feast. As a solicitous mother Sarah urged Abraham to send away Ishmael, his son by the servant-maid Hagar, whom she had seen mocking Isaac. At first Abraham hesitated, but at the command of God he complied with the wish of his wife; Isaac was thus declared the sole heir of his father. A critical event in Isaac's life occurred when God's command came that he should be offered as a sacrifice on a mountain in the land of Moriah (Gen. xxii. 2). Isaac showed himself in this trial to be worthy of his father. Without murmuring he suffered himself to be bound and laid upon the altar. But Abraham was prevented by God from consummating the sacrifice, and a ram that happened to be near was offered instead. At the age of thirty-six Isaac lost his mother. Abraham then charged Eliezer, his steward, with the mission of selecting a wife for Isaac from among his (Abraham's) own people. After a series of providential coincidences, Eliezer returned with Rebekah, whom Isaac, then forty, married (Gen. xxv. 20). For twenty years they were childless; at last Isaac's prayers were heard, and Rebekah gave birth to the twins Esau and Jacob. As the children grew the gentle and good-natured Isaac came to prefer the boisterous and adventurous Esau, who gratified his father withthe choicest spoils of the chase, while the quiet and less adventurous Jacob was an object of special regard to Rebekah: a division of feeling which became later a source of jealousy and hatred between the two brothers. A famine compelled Isaac to leave his abode "by the well of Lahai-roi." On this occasion he had his first vision. God appeared to him in a dream and warned him not to go down to Egypt, but to remain within the boundaries of Palestine, promising him great prosperity and numerous descendants. Isaac therefore settled among the Philistines at Gerar, where, fearing lest Rebekah's beauty should tempt the Philistines to kill him, he had recourse to a stratagem that had been used in similar circumstances by his father; he pretended that she was his sister. The Philistine king, however, was not long in finding out the truth, and, after rebuking Isaac for his deceit, adopted stringent measures for the protection of husband and wife. In his new home Isaac devoted himself to husbandry, and succeeded so well that he incurred the envy of the Philistines. They commenced a petty persecution against him, stopping up the wells which his father had dug, and which Isaac's servants had reopened. The peace-loving Isaac submitted patiently to these persecutions until Abimelech enjoined him to remove from Gerar. Isaac then pitched his tent in the valley of Gerar, shortly afterward settling at Beer-sheba, where God appeared to him for the second time and blessed him. An altar was built by Isaac on the spot where he had had the vision, and his servants dug a well. While living there Isaac received a visit from Abimelech, king of the Philistines, and Phichol, the chief captain of his army, who came to court his alliance. Isaac's old age was not a happy one. He was assailed by infirmities, and became totally blind. To this was added the enmity between his two sons. With prevision of his death, Isaac recommended his son Esau to bring him some venison and receive his blessing. At the instigation of Rebekah, Jacob, profiting by the blindness of his father, presented himself in Esau's stead, and received the blessing intended for the latter. This infuriated Esau to such an extent that Jacob had to seek safety in flight. Isaac died at Hebron, at the age of 180, shortly after the return of Jacob and his family from Mesopotamia, and was buried by his two sons in the cave of Machpelah, beside Abraham and Sarah. According to the Rabbis, Isaac was born in the month of Nisan, at noon, when the spring sun was shining in all its glory (Rosh ha-Shanah 10b; Gen. R. liii.). At that hour the sick were restored to health, the blind recovered their sight, and the deaf their hearing; the brightness of the sun and of the moon was intensified (Tan., Gen. 37); a spirit of justice began to prevail in the world: hence the name , a compound of and (= "Law was issued"). In the numerical value of each letter of the name there is an allusion: thus, the י (10) alludes to the Decalogue; the צ(= 90), and the ק(= 100), to the respective ages of Sarah and Abraham at the birth of Isaac; the ח(= 8) refers to the day of circumcision (Gen. R. liii.). Notwithstanding, there were slanderers who maintained that Abraham and Sarah had picked up a foundling, or, according to another haggadah, had taken a son of Hagar and pretended that he was their son. To silence these slanderers Abraham prepared a great feast on the occasion of the weaning of Isaac, whereat, by a miracle, Sarah was enabled to nurse all the sucklings that had been brought by the women invited to the feast. As there was no longer any doubt as to Sarah's maternity, the slanderers questioned Abraham's paternity. Then God imprinted on the face of Isaac the features of Abraham, and the likeness between father and son became so great that one was often mistaken for the other (B. M. 87a; Yalḳ., Gen. 93). According to some Ishmael committed the crime of attracting Isaac to the fields and there casting at him arrows and balls under the pretext of play ( ), but in reality to get rid of him (Gen. R. liii. ): for this reason Sarah insisted on Ishmael and his mother being dismissed. A fertile subject in the Haggadah is the attempted sacrifice of Isaac, known as the "'aḳedah." According to Jose ben Zimra, the idea of tempting Abraham was suggested by Satan, who said: "Lord of the Universe! Here is a man whom thou hast blessed with a son at the age of one hundred years, and yet, amidst all his feasts, he did not offer thee a single dove or young pigeon for a sacrifice" (Sanh. 87b; Gen. R. lv.). 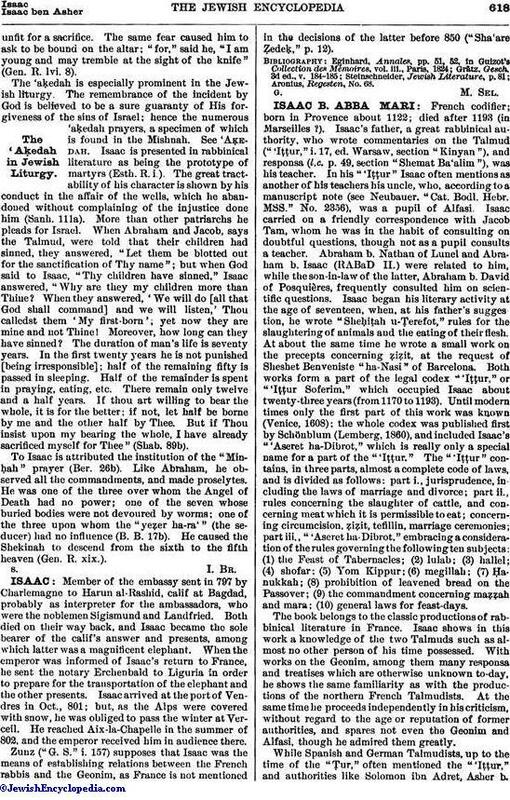 In Jose ben Zimra's opinion, the 'aḳedah took place immediately after Isaac's weaning. This, however, is not the general opinion. 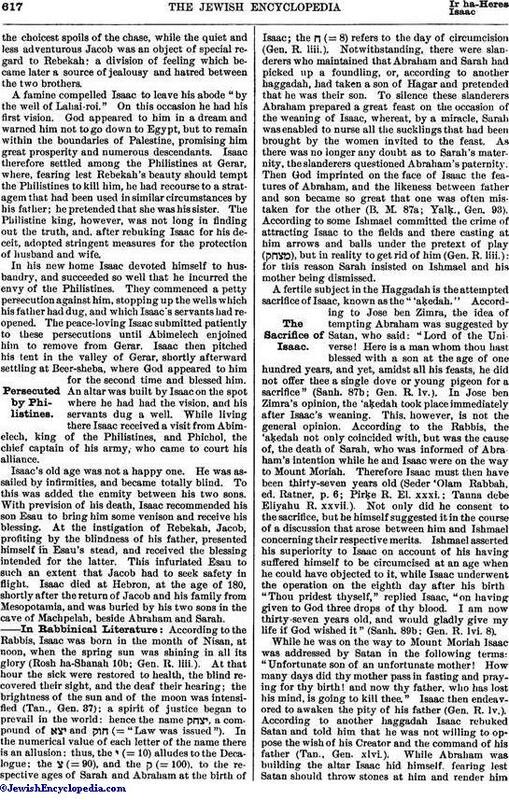 According to the Rabbis, the 'aḳedah not only coincided with, but was the cause of, the death of Sarah, who was informed of Abraham's intention while he and Isaac were on the way to Mount Moriah. Therefore Isaac must then have been thirty-seven years old (Seder 'Olam Rabbah, ed. Ratner, p. 6; Pirḳe R. El. xxxi. ; Tanna debe Eliyahu R. xxvii.). Not only did he consent to the sacrifice, but he himself suggested it in the course of a discussion that arose between him and Ishmael concerning their respective merits. 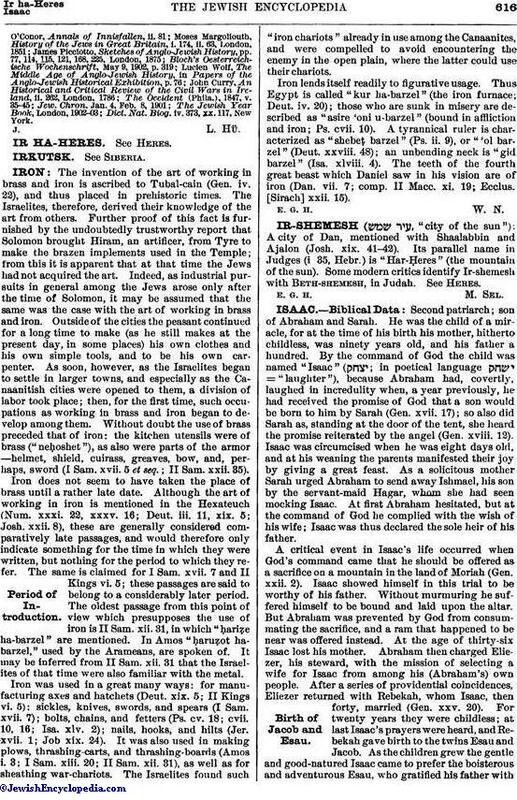 Ishmael asserted his superiority to Isaac on account of his having suffered himself to be circumcised at an age when he could have objected to it, while Isaac underwent the operation on the eighth day after his birth "Thou pridest thyself," replied Isaac, "on having given to God three drops of thy blood. I am now thirty-seven years old, and would gladly give my life if God wished it" (Sanh. 89b; Gen. R. lvi. 8). While he was on the way to Mount Moriah Isaac was addressed by Satan in the following terms: "Unfortunate son of an unfortunate mother! How many days did thy mother pass in fasting and praying for thy birth! and now thy father, who has lost his mind, is going to kill thee." Isaac then endeavored to awaken the pity of his father (Gen. R. lv.). According to another haggadah Isaac rebuked Satan and told him that he was not willing to oppose the wish of his Creator and the command of his father (Tan., Gen. xlvi.). While Abraham was building the altar Isaac hid himself, fearing lest Satan should throw stones at him and render himunfit for a sacrifice. The same fear caused him to ask to be bound on the altar; "for," said he, "I am young and may tremble at the sight of the knife" (Gen. R. lvi. 8). The 'aḳedah is especially prominent in the Jewish liturgy. The remembrance of the incident by God is believed to be a sure guaranty of His forgiveness of the sins of Israel; hence the numerous 'aḳedah prayers, a specimen of which is found in the Mishnah. See Ἁḳedah. Isaac is presented in rabbinical literature as being the prototype of martyrs (Esth. R. i.). The great tractability of his character is shown by his conduct in the affair of the wells, which he abandoned without complaining of the injustice done him (Sanh. 111a). More than other patriarchs he pleads for Israel. When Abraham and Jacob, says the Talmud, were told that their children had sinned, they answered, "Let them be blotted out for the sanctification of Thy name"; but when God said to Isaac, "Thy children have sinned." Isaac answered, "Why are they my children more than Thine? When they answered, 'We will do [all that God shall command] and we will listen,' Thou calledst them 'My first-born'; yet now they are mine and not Thine! Moreover, how long can they have sinned? The duration of man's life is seventy years. In the first twenty years he is not punished [being irresponsible]; half of the remaining fifty is passed in sleeping. Half of the remainder is spent in praying, eating, etc. There remain only twelve and a half years. If thou art willing to bear the whole, it is for the better; if not, let half be borne by me and the other half by Thee. But if Thou insist upon my bearing the whole, I have already sacrificed myself for Thee" (Shab. 89b). To Isaac is attributed the institution of the "Minḥah" prayer (Ber. 26b). Like Abraham, he observed all the commandments, and made proselytes. He was one of the three over whom the Angel of Death had no power; one of the seven whose buried bodies were not devoured by worms; one of the three upon whom the "yeẓer ha-ra'" (the seducer) had no influence (B. B. 17b). He caused the Shekinah to descend from the sixth to the fifth heaven (Gen. R. xix. ).